The Chairperson of the City Council’s Transportation Committee requested the review of the Fixed Base Operator solicitation. The committee had held proposed legislation to award this contract to Signature Flight Support pending additional information and the resolution of a protest from an unsuccessful bidder, Mercury Air Centers, Inc. The request for proposals did not provide instructions on how to complete the summary of the financial offer. The RFP did not describe how all submissions would be evaluated, such as the proposed facility improvements. 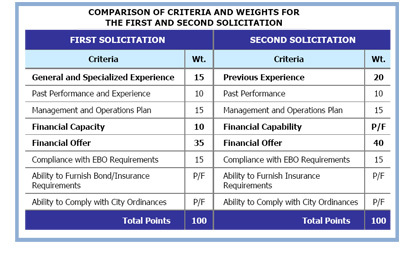 The firms’ financial capabilities were evaluated on different criteria than those in the RFP. Procurement did not provide guidance or instructions to the evaluators. Evaluators may have been swayed by implicit criteria or felt pressured to inflate small differences after the first solicitation failed.